Clean, neat and well looked after brick property circa 1998 in a quite Cul De Sac just off the main shopping strip of Williamstown, also with offstreet parking. There is a Queen Bed in the main bedroom with a lovely walk in wardrobe and double bed in the 2nd bedroom with a built in robe with the house comfortably accommodating 4 adults. Leave the Car at home and walk to all the attractions Williamstown has to offer! One block to main street, 2 min walk to the Strand overlooking the City of Melbourne,10 mins walk to Historic Nelson Place Precinct and 15 min walk to the Main Beach! 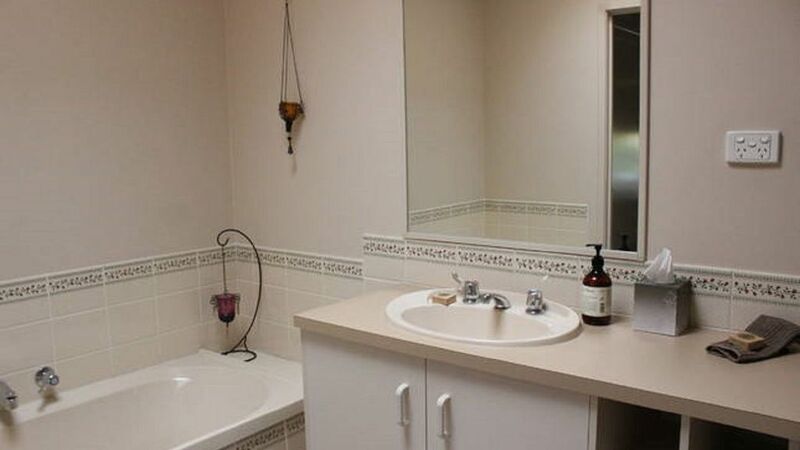 The big bathroom can be accessed directly from the main bedroom as well as the living area. There is also a sunny undercover outdoor area to sit in and exercise bike as well. We love the ability to wander along the foreshore and see the City of Melbourne from this unique viewpoint. Only 10 mins drive into Melbourne City or walk 7 mins to the Williamstown North Station to take the train into Flinders St Staion The bus service also picks up on the corner of the street. The many and varied restaurants/pubs/cafes in Williamstown will provide you with ample choice of meals as well as having attractions such as Scienceworks at your fingertips. Take a ferry over to St Kilda from Nelson Place jetty or a slow walk out to the restored ball tower. Complimentary toiletries, tea/coffee and linen is provided. Full Foxtel Channels and Nespress Coffee Pod machine, we leave a few complimentary pods but please bring more if you enjoy your coffee this way! Please note bond return conditions. Upons departure we would appreciate dishes washed and house left in tidy manner. If dogs were included in stay please ensure there is no dog mess left in yard and inside house, glass doors/windows wiped of any dog marks and rooms vacuumed for pet hair. Simple house, super clean and neat, fantastic quiet location. Owner was friendly and very helpful and responsive when making arrangements. The house was just the right size for our family of 4 (kids shared a room), and had everything we needed for our weekend stay - even breakfast cereals and milk in the fridge! Foxtel access meant we were also able to watch a family movie one evening. The location was ideal to Williamstown shops and walking distance to waterfront, so we were able to get the full experience of the area. Would love to stay again when making a weekend of it in Melbourne. Home away from home with many conveniences and comforts. Great location in central Williamstown conveniently near to supermarket, shops and restaurants. We are repeat visitors. Thankyou for the lovely review Anne, it’s always a pleasure to have you and your family stay! You are such wonderful guests! Thankyou for the lovely review Michelle, it was a pleasure to have you and your mum and dad stay! You are wonderful guests and looked after the house so well, we look forward to seeing you again! We regularly travel from interstate to work at Yarraville & Debs house in W'town suited us fine, only a 15min drive away.Difficult to get places where you feel at home, like this one. Thankyou for the lovely review Pamela, you were such wonderful guests and we would love to have you back sometime!